This week I have been visiting family in the mountains. My two boys have been busy playing and adventuring while my mother-in-law and I are cleaning up my in-laws house. It has also allowed me to catch up on all my blog posts, which often get placed on the back burner and get forgotten. As you may have noticed in my recent posts I am working on my breakfast routine. My two boys are doing great and have cut down dramatically on their sugar and white flour consumption. They have also been drinking more water and complaining less about the change in their diet. So how am I doing? I have been eating breakfast everyday for the last couple of weeks. When I first started I thought that it would be horrible, but I am feeling better and drinking more water, feeling more energetic and my weight is down to what it was before I had my first son. It may only be a few pounds, but I am very happy. A couple of weeks back I tried a new recipe for Apricot-Wheat Germ Muffins from Eating Well magazine, which looked perfect for a healthy breakfast. This recipe has 14 ingredients. It takes 1 hour of total time, a half hour of which is active and makes 12 muffins. For the orange juice I squeezed my own. Oranges are cheap right now, much cheaper than the price of orange juice and fresh tastes so much better in recipes. Instead of using brown sugar I used splenda brown sugar for baking. The finished product does have a slight splenda taste, but it was mild enough that my two boys did not notice. I did chose to leave out the grated orange zest. I had grated the orange peel to use and put it in the fridge. However, my youngest child decided to dump it on the floor, so I left them out of the recipe entirely. I followed the remainder of the recipe as written. These muffins were very popular with my two boys. They liked that they had apricots and didn't notice that they also were packed with wheat germ and whole-wheat flour. I ate a number of these muffins as soon as they came out of the oven. They are filling, without being heavy and are a great combination of taste and nutrition. Overall, another great breakfast muffin recipe. 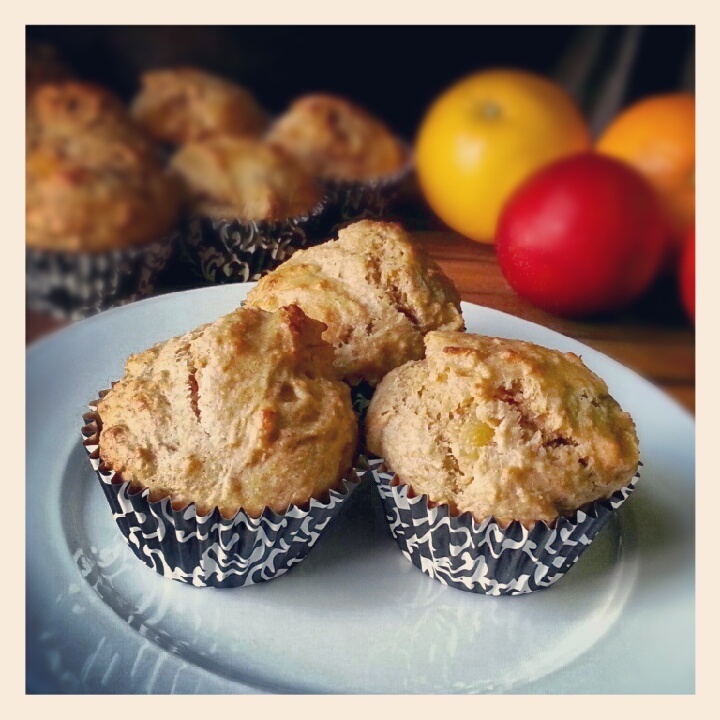 For the recipe go to Apricot-Wheat Germ Muffins. I love muffins also :) Followed you back! These look so yummy!!! Good job sticking to your breakfast routine! It's a work in progress :) Thanks for hosting!